Once again, generous Hibs’ fans have donated hundreds of football kits to under privileged children in the Ukraine as part of the Dnipro Kids charity. Dnipro Kids started in September 2005, following the Club’s UEFA Cup tie with Dnipro. A handful of supporters organised a charitable collection for some local orphans, which quickly grew to the ongoing support they provide to several orphanages today. 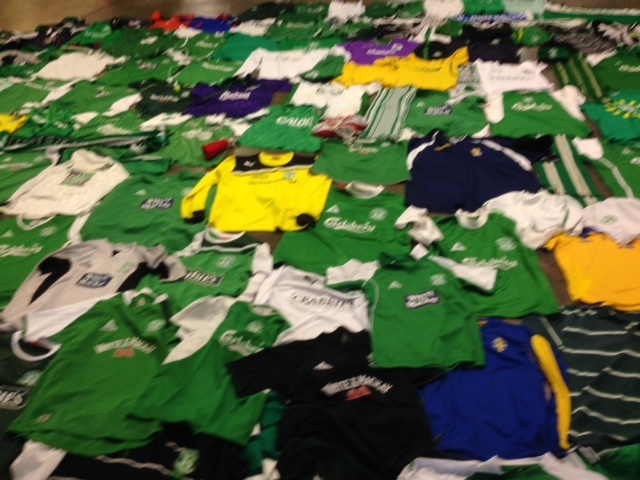 Hibernian coordinated a kit collection earlier this summer, with unwanted shirts donated to the Club during the launch week of the 2015-16 Hibernian Home Kit. The haul of donations was on display at the Leith Festival Open Day, and now a selection of kids kits have been handed over to Dnipro Kids ahead of their trip to Ukraine in four weeks time. The charity are still looking for unwanted kids kits (ages 6-16) that they can donate to the orphaned children. If you would like to donate you are welcome to leave kit at the West Stand Reception during office hours (9am-5.30pm, Monday-Friday) or contact steven@dniprokids.com. In March Chief Executive Leeann Dempster presented a cheque to Dnipro Kids to cover the cost of a staff member involved in the work in Ukraine, and the Club are delighted to help support the efforts again.